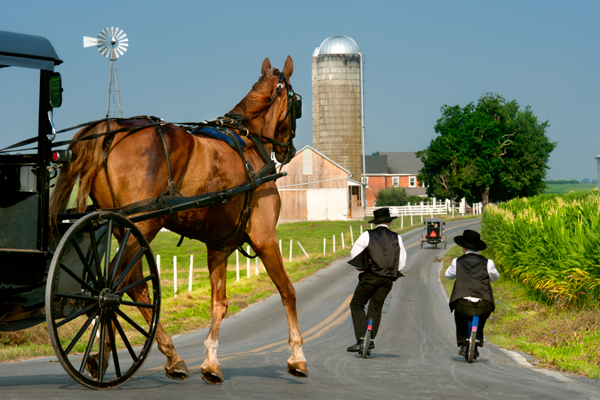 I have heard the saying, don’t put the cart before the horse,but never saw it in the real world till now. 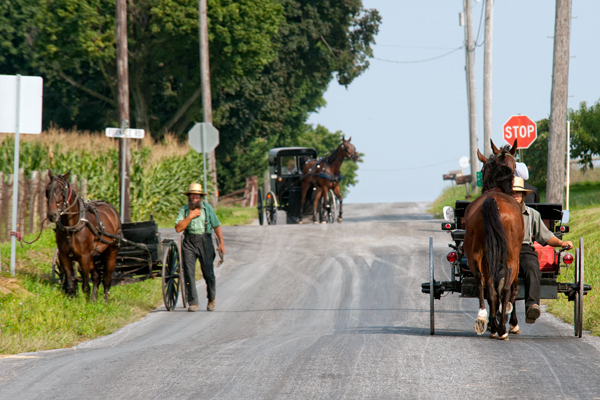 The horse and buggy on the right was leading the lone horse somewhere,but who knows.Not sure what the guy on the left was doing either,as he was just there on the backroad.This was a split second shot taken on the back roads. A morning dominated by fog and low light created a tough set of circumstances for shooting anything that was moving. I had been searching for something to shoot on this sunday morning and had no luck,so I decided I was just going to compose a shot and hope something would come by to finish off the image. 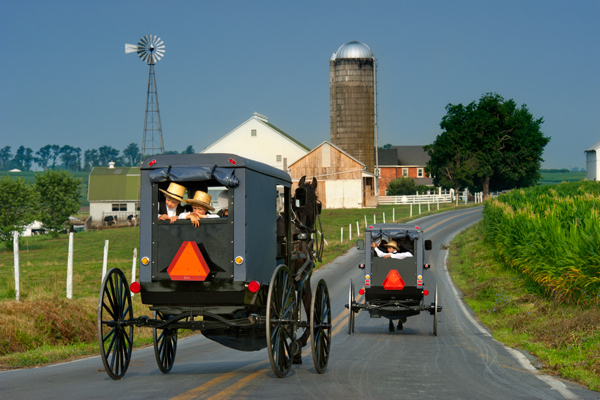 The Amish head to church at each others farms on sunday mornings from about 7am up till just before 9am,when the service seems to start,so after 9am there is no more activity on the roads. I set up on this back road at 815 and decided at exactly 9am I would call it a wrap.For 45 minutes there was not one single car,buggy or anything else on this road,and I was sure it was one of those mornings that nothing was going to pan out. I was watching the laptop clock and 3 minutes before pack up,I heard the sound of horse hooves coming. Buggies never travel this late in the morning,but here came two late ones,which allowed me one chance to get this shot,which thankfully I did. I think there was a little set of eyes peeking out the back as a hand pulls the canvas back a bit.Shot from my truck roof and connected to the laptop. This image is one of those special moments that make being a photographer so rewarding for me. 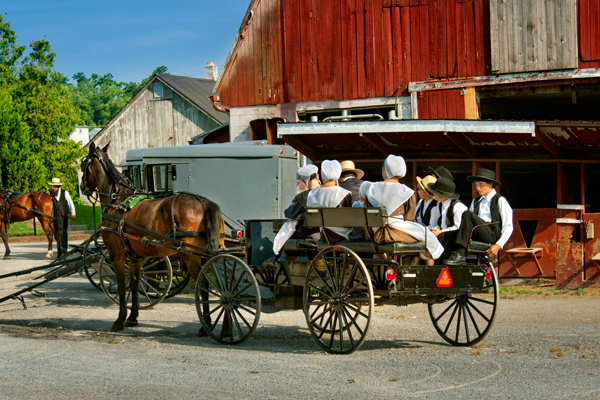 The young girls were riding on this miniature cart and were making their way to sunday church service at a local farm when they passed me at a covered bridge I was photographing with a friend. They headed on their way up the road and I decided to get in my truck and try and get one more photo of something I have never seen before, and figured never would again. They turned down this farm lane with others who were arriving on foot and I took this image through my open car window pretty quickly. Although I am extremely thrilled with the photo, For some reason I have this bad habit of tilting my head and consequently my camera when I shoot handheld,and the image was slightly tilted.My framing was less than ideal in this hurried moment so the image has a touch of tilt yet. Something I missed was a shot from the front showing the miniature horse that was pulling them,and he must have been a little powerhouse to pull five youngsters. 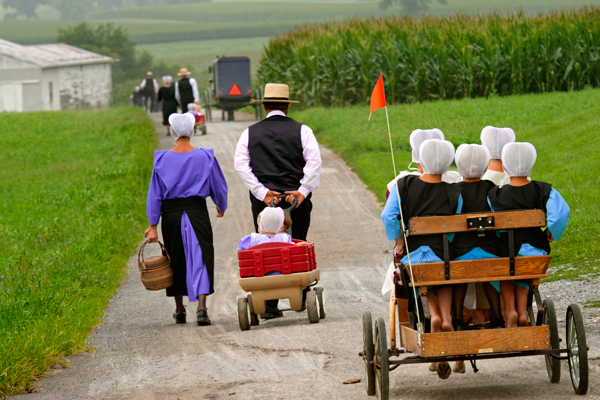 The other thing I really like about this image are the colors the people are wearing,and admittedly I am no expert on Amish ways and I have always wondered how or why they pick certain colors. they are usually very lovely hues and I have seen families dressed in the same color palette on more than one occasion. Todays posting features a road I have always thought had possibilities and last sunday I got several images in the span of fifteen minutes. I was out before dawn and got absolutely nothing over the course of three hours, so I decided I was going to just sit somewhere and see what I get. 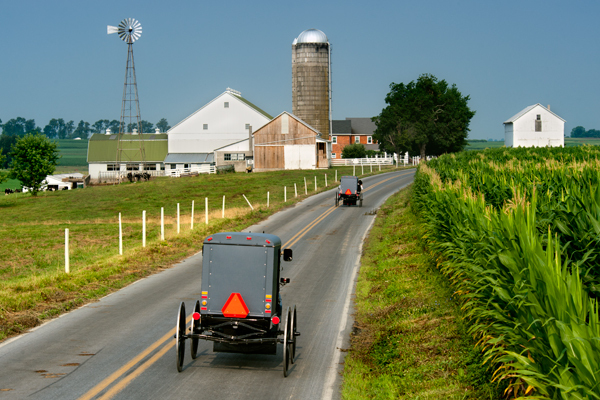 This road leads right by a farm so I set up my tripod real low at the edge of the field and a few minutes later I could hear the clip clop of buggies in the distance. The first two images had buggies turning from the left and the scooter boys coming in on the right from the T road. The last shot was taken from my truck roof after I changed my position and shows the farm better,but not the locals as well. I pre-focused for all the shots and used a wireless remote when subjects reached a certain spot, and even though I did this, the horse in number two is fairly sharp,even though I was focused about where the scooter boys are. They were moving at a good clip,so they are not razor-sharp. Focal length was probably around 200mm or so. This is a location I have driven by numerous times and never really gave it much consideration. This evening I turned onto the road and saw the late evening sun hitting the one room school and hilltop farm, and decided to set up and see what develops. 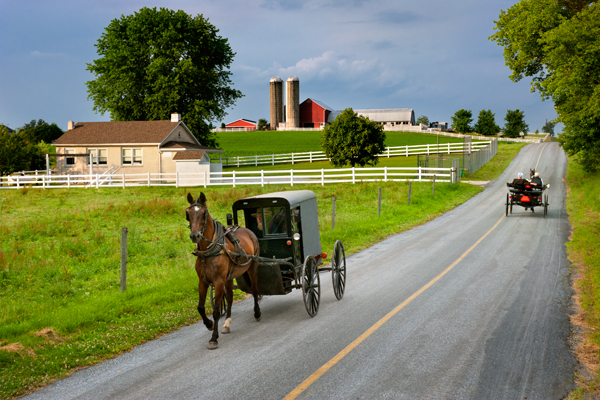 Once again I sat for close to an hour as countless buggies went zipping by on the road behind me, each time raising my anticipation and then never turning onto my road. Several times I set a time to leave, and several times extended it because I knew as soon as I moved a convoy would start coming by. My patience paid off as these two buggies came by. I like this scene because it has the one room school, a farm and the locals all in one shot.I utilized my rooftop setup and laptop to operate the camera. The scary thing is several times in recent weeks, I have found the images I am capturing are somehow not downloading to the laptop and are gone forever. I hear my camera firing and then no download, so when you wait an hour for one chance, you pray everything functions as expected and this time it did. 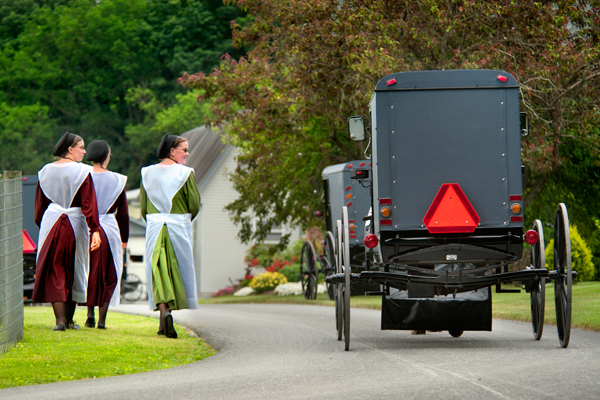 This is a quick snapshot from the road of an Amish family arriving together for Church at a farm in their district. I do not know how they decide which farm they are going to each week, but they do alternate. 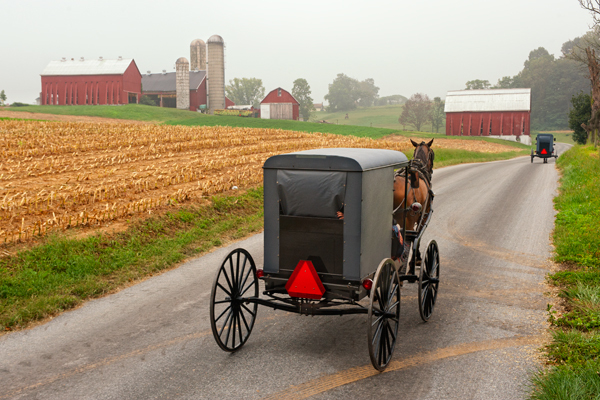 Sometimes you see buggies headed in every direction on a sunday, so it’s all a mystery to me.